Some habits are hard to break. And they leave behind unsightly, tell-tale signs on your smile. What if your newest beauty weapon was like an ‘undo’ button? 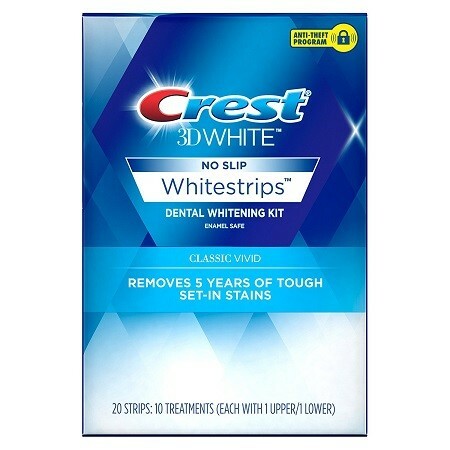 Crest 3D White Whitestrips Classic Vivid whiten some of the toughest stains. You’re left with visibly whiter teeth and a more beautiful smile. Can you spare just 30 minutes a day for just 10 days to reverse years of staining? Of course you can. Crest 3D White Whitestrips Classic Vivid makes it easy to whiten teeth and reveal a brighter smile. Using the same enamel-safe whitening agent as dentists use, your smile will be noticeably whiter in just 10 days. A: Because you shouldn’t settle for a smile that’s just ‘white enough.’ Every Crest 3D White Whitestrips teeth whitening system guarantees a whiter smile or your money back. See package for details. While Whitestrips and most whitening toothpastes remove surface-level stains, Crest Whitestrips remove set-in stains below the enamel surface for a visibly whiter smile. A: Here comes the technical jargon: Crest 3D White Whitestrips are thin, flexible strips that are coated with a tooth whitening gel. Designed to conform to the shape of your teeth, they work by keeping the teeth whitening gel in place against your teeth to remove stains below the surface of the enamel. Whitestrips use the same, effective whitening ingredient dentists use.